Home GENERAL KETO What is an Egg Fast? Ever since I had to take steroids this past Spring for my allergies, my system has completely rebelled. My hormones are out of whack, and my body has become completely resistant to losing weight. No matter how strict I am with keto – even counting calories and cutting out dairy, alcohol, etc. I have not been able to drop pounds. Even worse, every time I go off plan for the weekend or some event, additional stubborn pounds creep on. I know that a lot of you are struggling with this same problem, so I thought I’d do some research on ways to break through a weight loss plateau. One tried and true method to bust a plateau and get your weight loss going again is a fat fast. 3 days, 1200 calories per day – almost all fat. Most people just eat an entire block of cream cheese per day, a few ounces at a time. Ew. So much NO. Maybe someday I’ll try it for experiment’s sake, but for now it’s just not for me. Recently I started hearing about the Egg Fast and was intrigued. I’m planning to try it and track my results. I thought you guys might be interested in trying it too, so I’m posting some basics about it here for those of you who have never heard of it. 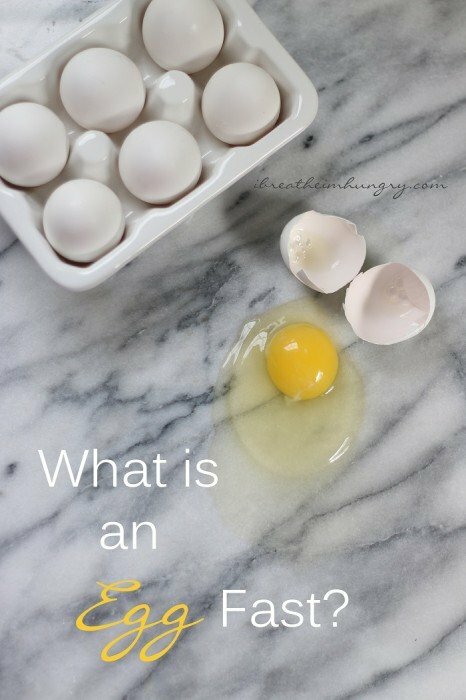 What is an egg fast? It’s a (short term) diet that consists of primarily eggs, cheese, and butter. 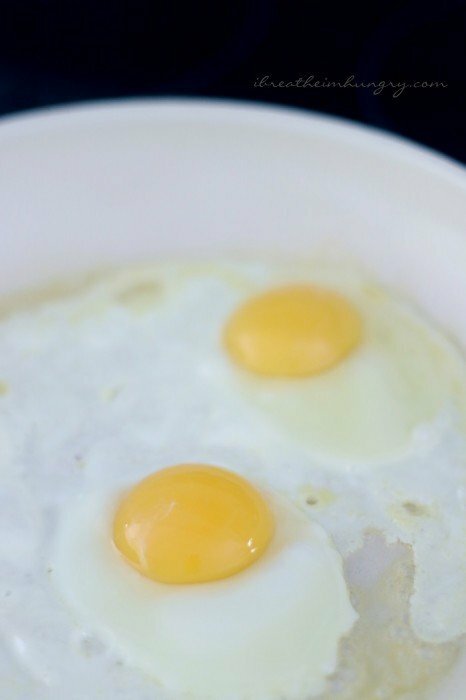 For each egg you eat, you should eat a corresponding Tbsp of pure fat in the form of butter, olive oil, or coconut oil. You can also eat a corresponding Tbsp of full fat cheese per egg. Doing this will result in an extremely low carb, high fat, moderate protein intake that will kickstart your body into fat burning mode. In my research on the egg fast diet I couldn’t find any scientific reasons as to why it works, but there are a lot of anecdotal cases of people who have had success with it. One of the most popular is from Jimmy Moore of Livin La Vida Low Carb who did it for a month back in 2010 and lost 27 lbs. You can read his story and the guidelines of the plan he followed here. Low carb maven Dana Carpender also reports having some success with the egg fast to shed some stubborn pounds – you can read her post here. Most recently I read a post from The Ketogenic Woman chronicling her success with the egg fast to break through a plateau, and that’s what finally convinced me to give it a try. There is a closed group on Facebook called Egg Fast – Stall = Breaker (diet) that I joined (and you can too if you’re interested) to get more information, and after reading through the threads it seems that the biggest issue people have is gaining the weight back when you go back to regular LCHF or keto. Across the board it seems that at least 90% of the people doing it will gain at least a portion of the weight lost back – though there are some who have kept almost all of it off with a careful reintroduction to their normal keto diet. The key to success seems to be cycling on and off for 4-5 days a week. While on your off days, you should stick to LCHF (keto) and even then, don’t go nuts. It seems possible to lose 8-10 lbs (or more) a month this way and keep it off. To be clear, while I’d love to do that, I’m not (at this time) planning to do the egg fast long term. I’m hoping that this one week egg fast will kickstart my metabolism, and get my body back in weight loss mode so that I can go back to my normal keto routine and start losing consistently again like I have in the past. We’ll have to see how that goes. Don’t go more than 4 hours between meals or snacks between 10am and 7pm. Supplement with magnesium and potassium (lite salt) daily. Small amounts of fresh herbs, hot sauce, no carb sweeteners, and spices will be allowed – as long as they are less than 1g net carbs per serving, not to exceed 5g net carbs per day. This may sound unduly restrictive, but you’d be surprised how many delicious recipes/combos that you can come up with using eggs, cheese, and butter (cream cheese pancakes anyone?) For those of you that are interested in trying it and want some structure, I’m working on a one week egg fast meal plan that I will post next week. I will strictly adhere to that same meal plan and will update you with my results at the end of my first week. 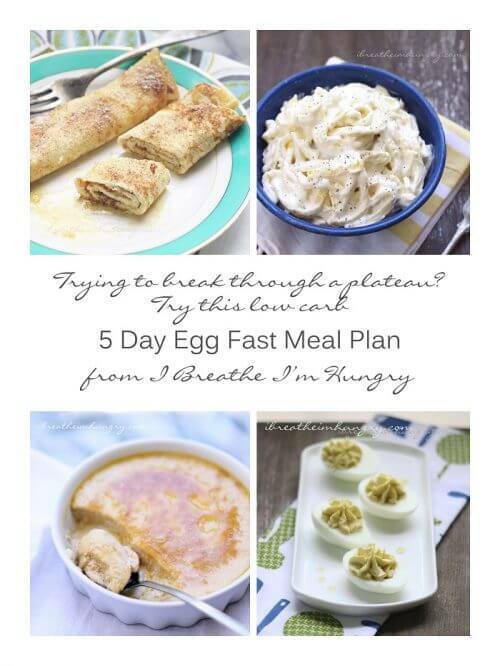 Update: Click here for my 5 Day Egg Fast Menu Plan! A word of caution: If you are not already fat adapted and are eating hundreds of grams of carbs per day in your diet, you may not want to embark on an egg fast until you’ve been in ketosis for awhile. Jumping right in can make you feel really lousy, and may even be dangerous if you have other health conditions. Consider trying my 3 Day Keto Kickstart first and see how you do before trying something as low carb and high fat as this egg fast. Stuck in a plateau? Is an egg fast something you’re interested in trying? Have you already tried it? I’d love to hear your results/thoughts in the comments! In other news, I’ve decided to prolong the ebundle that includes last year’s Summer and Fall ezines, along with my Amazon best selling cookbook The Gluten Free Low Carber! 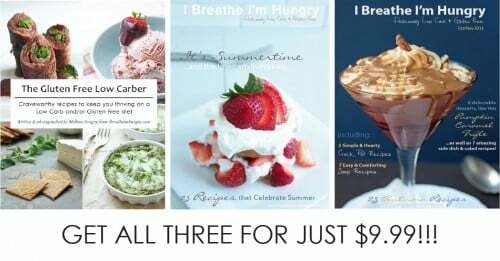 You can get all three for just $9.99! Get more information on ordering by clicking here! Next articleWhat Should Doctors Tell Their Patients About Low Carb Diets?